Woody Allen’s ability to test the limits of the protagonists he creates is one of the main reasons why I will never stop watching his films. The thoughtfully written scenes, that try to explore deep and complicated minds of female characters, give the actors every opportunity to stretch their muscles and fly like a phoenix. Every word he writes lets the performer own and deliver it in such a way that the viewer won’t even know what to admire the most – the fabulous, troubled minds, dangerously escalating emotions which can no longer be controlled, or the actor’s performance that crosses the line between reality and fantasy. And, surely, Woody Allen is the one who gives the actors the chance to master their work and shine on the silver screen. The story of the film is built around the lives of four individuals which, in an optimistic world could’ve turned in a positive way, as everyone would assume. In Woody Allen’s “Wonder Wheel” take place in a magical location – Coney Island in 1950’s. The amusement park of the island does not amuse its guests much. Yet, the wheel turns in an opposite way for the four main characters – Humpty (Jim Belushi), Carolina (Juno Temple), Mickey (Justin Timberlake) and Ginny (Kate Winslet). The latter is a moody woman with a trapped mind, unfulfilled dreams and uneventful life which is ready to explode any moment. Mickey is a young, handsome lifeguard at the beach who dreams to become a playwright one day. Carolina is in her 20s. She runs away from her racketeer husband Frank and reunites with her estranged father Humpty – a man whose check balance is being controlled by his wife Ginny, who probably does not even realize the need of an immediate medical attention of a psychiatrist. The lives of four characters develop into a chaotic, insane mess that is at times unbearably painful to watch. Especially, when written by the master of manipulation of a human behaviorism – Woody Allen. In his films, we should never expect a magic or an unrealistic conclusion. That will never happen. Each and every scene is a pure masterpiece for the viewer’s eyes to witness. The beautiful colors, scenery, tastefully selected soundtrack and even the costumes transport the viewer’s mind from the 21st century to 1950s, where we fall in love with Ginny and Mickey, expect the unpredictable from Carolina and Humpty, whose patience has its limits he is yet to find out. On top of all that – the performance delivered by the golden four, where one can barely tell the difference between perfection and sublimity. While Juno Temple, Justin Timberlake, and Jim Belushi, as actors, created the musicality of their characters, Kate Winslet subtly danced from one scene to another – like waltz – with no down moments, but up, and only up. Now, try to imagine you are a racer, who has started the engine and prepared for a speedy ride. Every time you accelerate the speed, the sound of the engine gets louder and louder. At some point, you drive so fast, that the noise from your engine begins to sound like the most favorite song you’ve ever heard. And that is when you know, there is no way it could get better. The same way, Kate Winslet masterfully carves every move of Ginny to cement her in the history of cinema forever. In conclusion, what else needs to be said about “Wonder Wheel”? It’s a beautiful piece of art, created by the imaginative mind of its author. Astonishingly described characters, who are so rich and colorful that they fill every minute of the film with different events occurring in their lives. It is a memorable journey you will be making as a viewer, from which you will never want to get off. Just enjoy the ride. 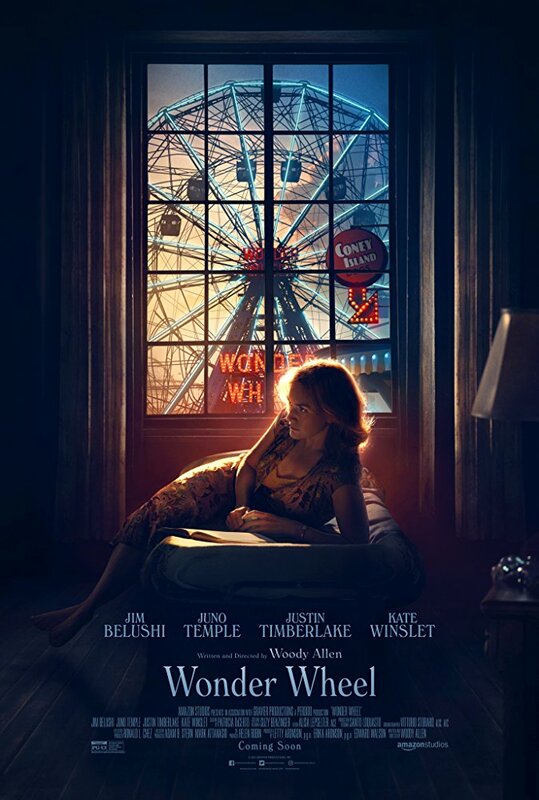 Taste the delightful life through “Wonder Wheel”, and feel a bit jealous, in case if you were unable to catch glorious time described in the film. I enjoyed your review and am glad to find someone who thinks so highly of this film. I couldnt generate as much enthusiasm as you. Cinematically there is just a bit more good in this film than bad, but only just. It is overly theatrical and hyper-melodramatic, and I found it a strain to watch despite Kate Winslet’s intense performance. I gave it 3 out of 5. I have been a fan of Woody Allen all my life, and his, for his ability to produce movies like Wonder Wheel. I was able to identify and feel emotion for every character and know deep down truths and wisdoms were being reveled about not just the characters, but every person alive. The cinematograph matches the mood and the performances. This is the difference between just watching a story, and living it. It was magnificent. It illustrates how people can be flawed, but redeeming. Not good or bad, just human. Somewhere between angles and demons.